SO YOU WANT TO CLIMB DENALI? So the lure of “the great one” is getting to the point where you have to either settle for just reading about other peoples’ adventures, or get out of that chair to do something about that unexplainable urge. Mt. McKinley (aka Denali) has certainly received her share of publicity over the last 90 years or so. Between the written accounts of climbing this massive geological feature, and her spectacular photo images, it is no wonder to anyone with the love of climbing that you are thinking about venturing on her slopes. The experience of being on this mountain is definitely worth the try. Contrary to what a few people say, climbing Mt. McKinley is not a glorified extended hiking trip, even by the popular West Buttress route. For many climbers — both new and pros to the high-altitude scene — climbing McKinley could be the hardest thing they have physically tried to do. Preparing yourself is a definite precursor to having a great experience on this mountain. Mt. McKinley will call upon all your strength and fortitude in order to face up to the challenges that she will lie before you. Some climbers will tell you that they had good weather, no adverse altitude affects, and no serious problems on their expedition. They were the fortunate ones. For the number of times that I have been on this mountain, as a guide and recreational climber, no two trips ever came out the same. I have done trips that had very few problems, yet in the same season, returned to have what I would recall as “the Denali trip from hell.” Do not take this climb for granted. One of the most often-asked questions I receive as a mountaineering guide, is “How should I train for climbing McKinley?” Since each individual has his or her own schedule, physical and mental abilities, goals, and determination, the answer to that question is not set in stone. But, in order to help my clients, I have come up with suggestions on how to prepare for the rigors of climbing this mountain. You may find that it is a good place to start. Use it as you see fit and modify it for your own purposes, but keep in mind that your ultimate goal is to be as physically prepared as you can possibly be for this adventure. This physical conditioning program is designed for those of you who aspire to attempt a Mt. McKinley expedition, or something similar to it. You should have a clean medical bill of health or, at least, a physician’s approval to attempt this adventure. This program assumes that you are not the type of person who has been working out on a regular basis and you do not have easy access to a nearby mountain of any substantial altitude. Of course, the more physically fit you are, the easier this program could fit into your lifestyle. You should keep in mind that however you use or modify this suggested training program, the purpose of it is to tax your physical stamina and strength gradually. You may find that this program is too easy, so you need to increase the duration or modify the exercise to cause you to exert more energy. For some of you, this program may start off too hard, and so you must gradually work into the routines and increase your stamina and strength one day at a time. Whatever you do, once you have made the serious commitment to this program, stick with it! Give yourself ample time to get ready for this expedition. You should be able to walk and climb moderate snow and ice slopes for up to six to eight hours a day, carrying up to 50 lbs. of supplies on your back, and pulling up to 35–40 lbs. of supplies on a sled (at the same time!). You should be able to recover from a hard day’s climbing within an eight to 12-hour period to resume another day of hard physical exertion. You should be able to physically and mentally go the extra mile when called upon for survival reasons. Completed a mountaineering course and 1–2 climbs prior to attempting Denali. Climbed as much as possible in the seasons leading up to Denali. Longer gaps in climbing (nine to 12 months or more) prior to Denali can prove difficult — we have had strong climbers do little in the year leading up to Denali that have been disappointed. Trained on a glacier and with heavy packs. The Alps, for example, have not proved well for Denali training (though great for climbing experience) due to the difference in terrain and very light packs. Increased their already existing training regimen at least six months prior to their departure date. Please note that climbers who are unprepared will likely be asked to leave the expedition. This will be at the guide’s discretion with an understanding of safety and knowledge of how much each climber has put into their preparation. Guides decisions are based on a combination of skills and fitness level with group safety as a key decision maker. While our goal is to provide a rewarding experience for every climber, some issues such as fitness bear some self-assessment and may not be evident prior to the expedition. 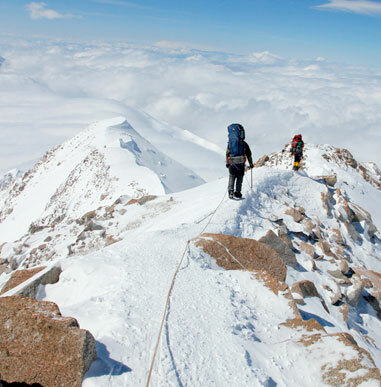 Every climber must meet a series of prerequisites before joining a Denali expedition. These prerequisites not only add to the safety level of each climb, but help us to build well-rounded, similarly skilled teams. Screening climbers is one of our more difficult tasks: we can inquire about your skill and fitness levels, but this does not ensure the expected level of readiness on the day of the climb. Thus, we ask each climber to train hard, make sure they have met the skill level requirements, and be open to suggestions for courses, training, and winter skills. Please be well-prepared for this climb as it helps to galvanize our teams of climbers and guides and makes for a much more pleasurable experience. Our pace on the mountain is moderate by mountaineering standards. While a select few climbers were able to successfully join a Denali trip after a single course, the vast majority will greatly benefit from more climbing experience. We work with and asses each climber on an individual basis. Please contact Gordon Janow at gjanow@alpineascents.com to discuss preparing for Denali or to share your climbing bio. 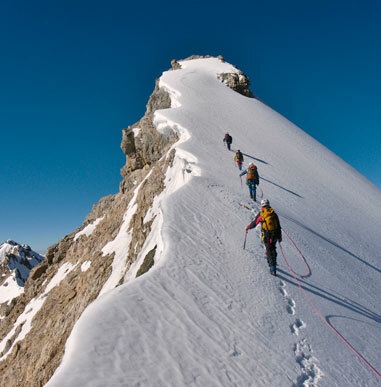 Denali requires proficiency in basic mountaineering skills including: cramponing, walking on snow, self-arrest, crevasse rescue, and glacier travel on a rope team. Gaining these skills generally requires, at minimum, completion of our Denali Prep Course (this course is best for climbers with some prior experience, as early season conditions can prove difficult for learning basic skills); or our 6-Day, 8-Day, 9-Day, 10-Day, 12-Day, or 13-Day training course; or have equivalent skills and experience gained in an appropriate training location. In addition to an introductory course, most successful climbers have completed a week long or longer intermediate/advanced course and have attempted one to two additional peaks, utilizing skills learned on those courses. Climbers should be climbing in the prior seasons leading up to Denali. Completing a course or a series of climbs and then not climbing for year or more leading up to Denali has not served climbers well. Washington’s North Cascades, Rainier, and Alaska, are examples of great training grounds for Denali. Those who climb and/or train in the Alps and some other locations, generally have a difficult time on Denali as they have not established a comfort level on the type of glaciers found in Alaska or have carried the heavy pack required. 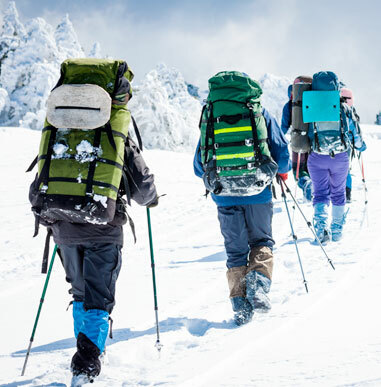 You should be able to walk and climb on moderate snow and ice slopes for up to eight hours per day, carrying a 50 lb. pack and an additional 35–40 lbs. on a sled. You should be able to recover from a hard day’s climb within an eight to 12-hour period and resume another day of demanding exertion, and maintain this pace for 21 days. You should be mentally and physically prepared to go the extra mile when necessary and be ready for weather changes, team emergencies, and summit bids. After already establishing a good baseline fitness level, a successful Denali climber steps up their regimen at least six months in advance for this climb, so please review the six-month training regimen. Climbers should have winter camping skills and a good understanding of personal care (i.e. understanding of frostbite, nutrition, and hydration issues) for a three-week expedition. Climbers should be ready for the mental demands of a Denali expedition. This includes being patient with fellow climbers and guides, being prepared for long hours in a tent during inclement weather, pushing yourself to your limits, and understanding expedition life. If you are interested in climbing Denali, please submit your climbing and training bio for review. Work out four days a week this month, rest one to two days and, if you are up to it, use one of the rest days to do a fun workout (e.g. ice or rock climb, biking, skiing, skating, etc.). Try to find friends that will work out with you. They can be the motivation for you to get into the routine. It is harder to forgo a workout when you know that someone is planning to work out with you that day. Aerobic training is the emphasis of your program. You want to have the endurance to exert energy for hours at a time, day after day. This month, put in at least two hours per week (30 minutes per day) of aerobic exercise. This exercise should be a continuous effort for the given time period. The most popular type of aerobic exercise is running, but biking, swimming, cross-country skiing, and hiking are also good substitutes. Interchange them each day if one gets boring. Both my editor and guiding boss are biking fanatics and they highly recommend mountain biking and road biking as excellent forms of aerobic and leg strengthening exercises. The objective of this month’s aerobic workout is to get your heart rate up to between 30 and 40 beats faster per minute (over the 30-minute workout) than your resting heart rate. Some workout professionals call this the “conversation intensity” where you are working out at a level that allows you to talk to someone during the workout, without dying. You may not start off thinking that you can talk with your heart rate up that high for long periods of time, but you will need to gradually work up to that ability. One set of sit-ups (abdominal crunches) — as many as you can do. Three sets of pull-ups and/or chin-ups — up to 15 repetitions per set. Three sets of as many push-ups you can do — up to 40 repetitions per set. Three sets of bent rowing exercises with weights that will allow you to do 10–15 repetitions per set, but no more than 15. Three sets of military presses with weights that will allow you to do eight to 10 repetitions per set but no more than 10. Muscle fatigue should set in on the last few repetitions of each set and muscle failure should occur on the last repetition of the third set, if you have selected the proper resistance. Do not make your strength routine time consuming or boring at this early stage. Monday: Run for 30 minutes at a “conversation” pace. Try not to stop, but if you feel that you have to, try to maintain a brisk walking pace. Strength train today with the sit-ups, pull-ups, and push-ups routine. Tuesday: Bike (or substitute another aerobic exercise) for 30 minutes or longer. (Remember that you want to get a workout!) Try to go somewhere different today than on Monday’s workout. No strength workout today. Wednesday: Strength workout today. You may want to include a few more strength exercises than you did on Monday. Rest from aerobic exercise. Thursday: Run for 30 minutes like you did on Monday. Find a different route again. You might want to travel to a wilderness trail, if one is close by. No strength workout today. Friday: Cross-country ski (or substitute another aerobic exercise) for 30 minutes or longer. Repeat Monday’s strength workout. Saturday: Rest day or do something recreational. Go climbing or hiking for fun. Some forms of aerobic exercise, such as biking, may not require you to exert the same amount of energy in a given amount of time as compared to running. You will need to monitor how you feel and adjust the duration and/or intensity. I recommend that you do not jump into any form of exercise without a light form of warming up first. Some stretching of the muscles you are about to use heavily is a good way to prevent injuries and get your skeletal-muscular system prepared for your exercise routine. Remember that you are not training to compete in the Olympics next week and this workout schedule is probably a change in your current lifestyle, so take it gradually and easily to begin with this month. You want to maintain the training, so it is better to do parts of this program rather than none at all. The focus of this month is building a foundation for your mountaineering fitness. Aerobic workouts should still be, at least, four days a week with no more than two days rest per week. You should substitute one rest day for your recreational day. Increase the duration of these workouts to at least 40 minutes, but you must now make sure these sessions are a continuous effort. Strength workouts should remain at three days per week. Try to increase your weights and/or reps, but do not exceed the maximum reps stated earlier. The focus for this month is building your endurance. Aerobic workouts should now be five days per week, with one day rest. Increase your workout sessions to a minimum of 45 minutes. Concentrate on working continuously throughout the entire 45 minutes. Continue to include a hill- or stair-climbing workout with a backpack at least once a week. Increase the weight carried in your backpack by 10 lbs. and the duration of this session to 35–45 minutes. You can substitute one or two of your aerobic workouts with the hill- or stair-climbing session. Be careful with your knees on downhills. Strength workouts should increase to four days a week. Increase weights and repetitions, but again, do not exceed maximum repetitions already mentioned. At this point of your training you may find that motivation might be lacking at times. Don’t give up! Be creative, find new places to train, more friends to train with, go climbing to get psyched, read books on mountaineering, and watch videos or slide shows of other mountaineering adventures. This month you begin your training in earnest. You must now get mentally conditioned, as well as physically. Take each day as it comes. You may want to consider taking a good daily multi-vitamin with the RDA of iron, if you do not already do so. This will ensure that your body is getting its recommended amounts of vitamins and minerals that you might need with your increased exercise routines. The iron will assure that your blood will have the iron needed to maintain the hemoglobin in your red blood cells (good for carrying oxygen). Don’t forget your daily intake of water and eat a healthy diet. Your aerobic workouts should remain at five days per week, with one rest day per week. Your sessions should now last a minimum of 50 minutes. Incorporate a shortened “stress” or anaerobic workout session for one day of the week. This workout should be around 30 minutes, and you want this session to get your heart rate up to around 130 to 180 beats per minute for at least one minute duration at a time, but not longer than two minutes. Recuperate between these high-intensity bursts within three minutes before going at it again. Physiologically, the faster your heart rate during the stress exercise, and the less rest time you give yourself between the exercises, the more training benefit you will reap. You should really be working hard during this session and feel relatively exhausted at its end. An example of this type of workout is running a hilly course, sprinting uphill (as your high-intensity burst), and jogging the downhills and flats, for your recuperation. This type of workout is one of the best natural ways to build up your red blood cell count (which is responsible for getting oxygen to your cells) and getting your cells to get rid of lactic acid (a waste product of cellular respiration and cause of muscle fatigue) more efficiently. On one of your aerobic workouts, include what I call the “McKinley Edge.” This is an extra uphill run, a longer or added loop, or an extra spurt of effort included in a workout to get your mind ready to handle the “extra mile” effort that might be required on Denali. You need to determine your “McKinley Edge” before you start the workout and stick to that plan. Strength workouts remain at four days per week and should be a habit for you by this time. Increase your weights and repetitions accordingly. This month try to get out into the wilderness once or twice to test your gear. Make sure your boots are comfortable, apparel fits and does what you want it to do, tent sets up easily, backpack fits and handles the heavy loads, sleeping bag feels good, and you are getting familiar with the stoves, etc. The only way to do these things is to go camping and climbing. You do not want to find out that things are not just right on Denali. You can substitute two of your aerobic workouts for this outing if it is an overnighter. Maintaining your routines and your health is key for this month. Continue your aerobic workouts at five days per week with at least one rest day. Workouts should be a minimum of an hour in duration. One aerobic workout per week should last for at least an hour and a half. Continue with at least one stress session per week and shorten the rest periods between the high intensity portions. Remember to include the “McKinley Edge” to a couple of your workouts every week. Your hill- and/or stair-climbing workouts should now be a regular substitute for an aerobic session twice a week with at least 40 lbs. in the backpack. Wear your climbing boots for these sessions to get used to them, if you have not been doing so already. Strength training is now for endurance purposes. Continue to strength train four times per week, but use two of those days for emphasizing repetitions done quickly. If you have someone who can time you, do your exercises in the same number of sets, but use lighter weights (decrease your resistance by 40% of what you used before) and do as many repetitions as you can in a minute per set. You should use a weight that gets you to almost complete exhaustion at the end of the minute. If no one is available to time you, do your exercises until muscle failure. (Caution: do not lift free weights alone!) The other two days should be used to maintain your routine from last month. Again, this month get out to the wilderness and test your gear. Get the kinks out of them and you. Remember to still drink your quarts of water, eat well, and get lots of rest. THIS IS IT! The final month to tune up for this long-awaited climb. This is the month of training that will get you physically up the mountain. You will probably be busy with all the logistics of your expedition this month, but don’t neglect your training. Your aerobic workouts will still be five days a week. Remember to rest at least one day per week. Each workout session should be maintained at a minimum of one hour in duration. You should be able to do two stress sessions per week. You can forego the stress sessions the week prior to departure. These stress sessions do not need to increase in duration, but the recovery periods should be shortened again. The hill- and/or stair-climbing workouts, with a loaded backpack, should dominate your aerobic workouts now. Increase the weight in your backpack by 10 lbs. If you hate to give up the running or other aerobic exercises, then do the hill- and/or stair-climbing workouts in addition to the others. Remember what you will be primarily doing on the mountain. The “McKinley Edge” should now be a part of every aerobic workout session. Your strength workouts should still be maintained at four times per week, concentrating on the number of reps with lower weights. You are not interested in building bulk at this point. By this point, you should be physically prepared to become the mountain Hard Man that you’ve always dreamed about. Denali will give you a good run for your money. Always remember that nothing is for sure on Denali. Without being at high altitudes at that latitude, you cannot predict the effects of altitude, and no one can accurately predict the weather. Both of these factors have stopped even the most physically fit mountaineers. I would recommend that every prospective McKinley climber get as much advice as they can from experienced high-altitude climbers, especially seasoned Denali ones. If you cannot personally talk to one, check out the many books on Denali at your local library. There are many facets to climbing Mt. McKinley. Being in decent physical condition is only one of those facets. Be prepared for the total mountaineering adventure. Hopefully, your experience will be a good one. Good luck and BE SAFE! Excellent – both guides were of the highest quality.